Lewin’s Honeyeater is the extremely similar counterpart of the Yellow-spotted and Graceful Honeyeaters that replace it in foothill and coastal districts. Its loud staccato call is one of the familiar sounds of upland rainforests. It feeds mainly on insects, nectar and fruit. Many have learnt to visit picnic tables to look for crumbs. Several are daily visitors to the lodge railings at Chambers Wildlife Rainforest Lodge . 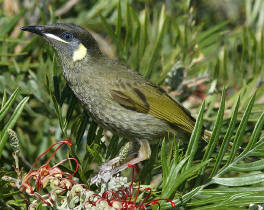 This medium sized honeyeater is one of the most common and diagnostic birds of the Australian east coast rainforests. In the tropics it is usually found at higher altitudes. It's call is one of the most familiar and distinctive sounds of the rainforest, a fast 'machine gun' like series of whistles. If you get a good, close look, you may notice that it tends to be slightly chubbier than the other Meliphagas, the yellow patch tends to be fuller and more of a half moon, and there are small scale like marks on the breast.